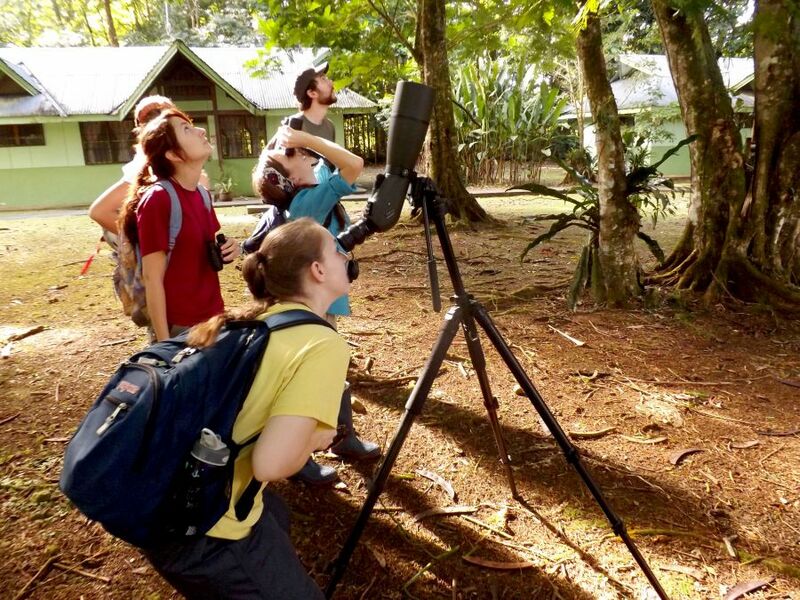 Carter has joined 11 fellow biology students, graduate teaching assistant Molly Schumacher, and Biology Professors Joseph Armstrong and Steven Juliano on a rain forest immersion trip to Central America’s most prominent eco-destination. The group arrived Thursday in Costa Rica and is spending 10 days at La Selva Biological Station. La Selva, “the jungle” in Spanish, is a world-renowned research center in Costa Rica’s Caribbean lowlands. It is about a two-hour drive from the capital of San Jose and what seems like a world away from Central Illinois’ endless cornfields. In fact, the station’s nearly 4,000 acres have, in some regards, more animal and plant diversity than the entire United States. The students were introduced to the rain forest during the bus trip from Juan Santamaria International Airport. They passed by the cloud-shrouded volcanoes of Braulio Carillo National Park, whose 109,000 acres abut La Selva. “It reminded me of Jurassic Park,” doctoral student Kristin Duffield said. The students came here as part of the Rain Forest Ecology course. The class comprises four graduate students—Carter, Duffield, Christine Hodges, and Meghan Strange—and undergraduates Jennifer Achs, Corinne Cramer, Rebecca DeHeer, Katilyn Gerstner, Sarah Kluk, Brandon Mardoian, Alexandra Rossi, and Taylor Zarifis. Each student must complete a research project while in Costa Rica and present their findings after they return to the United States December 2. Christine Hodges looks up a sloth that was high up in a tree near the cabins. La Selva is the perfect setting for the students for a few reasons, Armstrong said. For one, it is a world-class research facility that boasts comfortable cabins and amenities like a laundry room, a convenience store, and an open-air dining hall that lets the students enjoy their meals just feet from the tropical splendor. The students also benefit from the fact that researchers have been studying the area’s flora and fauna since the station’s inception in 1954. “It means you’re not starting from zero,” Armstrong said. Armstrong first visited La Selva in 1993, to do research. After seeing the facilities and the area, he realized he could bring a class there, which he and other Illinois State University biology professors have been doing every year since 1996. Armstrong said experiencing how different the tropics are from the northern temperate zone may be the most important lesson for these young biologists. “Until you see the tropics, you don’t know very much,” he said. For example, La Selva has more than 1,200 tree species, Armstrong said. The United States and Canada combined only have about 950 species. There are also 500 species of ants and 466 species of birds at the station. “That’s the tropics,” Armstrong said. 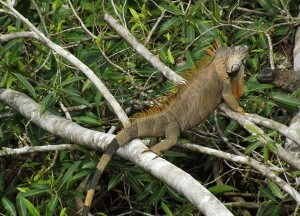 An iguana hangs out by a river in La Selva Biological Station. And since this is the tropics, there are also lots of snakes: 57 species, including the venomous fer-de-lance and bushmaster, La Selva guide Albert Urena said. Accordingly, he warned the students not to wear sandals or other open-sole shoes even while wandering around their cabins. La Selva’s facilities are adjacent to the forest, in a campus-like setting. But where one ends and the other begins is not real clear. During a hike Friday morning, Urena pointed out a three-toed sloth high among the trees just outside the group’s cabins. Later he showed the students child-size iguanas, chestnut-mandibled toucans, howler monkeys, and collared peccaries all before they “entered” the forest. During a hike the night before and not always farther afield, the students and professors had peered through cameras in the darkness, like paparazzi hunting celebrities. They spotted a tarantula, a kinkajou, a couple of frog species, a wolf spider, and what appeared to be a hummingbird sleeping upside down. The students and professors didn’t just gawk at the animals; they treat the forest as a living classroom. Armstrong said the students get 12 hours of instruction per day for the three-credit-hour course. During their hikes students and professors discuss any animal or plant that grabs their attention. This group can turn a one-mile hike into a three-hour tour through the big and small of the biology world. And an army of leafcutter ants, a rubber tree, or a spider web can generate as much excitement among these biologists as some of the rain forest’s more high profile residents. “The biodiversity down here is just tremendous,” Duffield said. The rain forest forms a sea of green at La Selva Biological Station that is broken up by only the occasional trail or river. Look for more on the Rain Forest Ecology trip to Costa Rica. STATEside is along for the adventure and is publishing a story a day through Wednesday.